Montana Singapore @ PoMo | JACQSOWHAT: Food. Travel. Lifestyle. The extensive menu served up a spread of items, ranging from all day brunch, salad, pasta, burgers as well as waffles in savory or sweet. 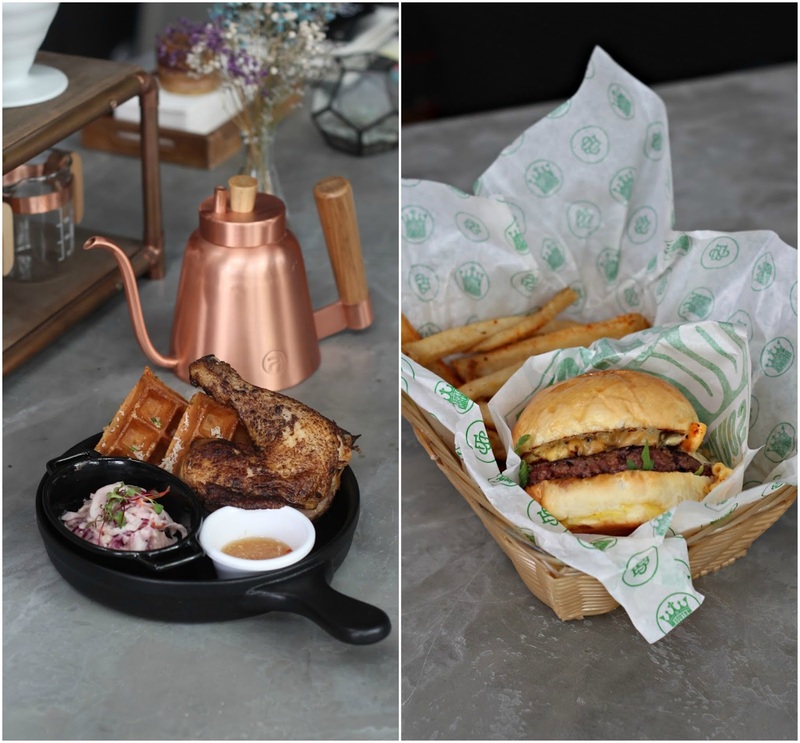 Indeed, the new Montana puts a new spin on their food, with innovative versions of classic dishes. Something special from any other coffee place, Montana has created their own coconut cold brew by steeping ground coffee in coconut water. With different variations, I had the Gula Melaka $6.80 with coconut cold brew, giving lush notes of caramel. Overall an interesting twist on a caffeinated cold beverage. Tried one of their recommended savoury waffle - Peking Chicken Confit with Waffle $16.50. Chicken confit marinated with 5 spices, topped with chive waffles and served with smoked ginger plum sauce. I was pleasantly surprised the chicken confit texture was soft, easily remove from the bone. Besides the highly raved crab burger on the burger menu, we had the Mac Daddy w House-Made Bun $17 instead because how can one resist Mac N Cheese! The burger is stacked with 160g beef patty, jalapeño together with a layer of Mac N Cheese, served with thick cut fries. I enjoyed the combination, wish they were cheesier though. You have probably seen of heard epic Freak shakes (over-the-top milkshakes) in Singapore but how about Freak cakes? The folks at Montana has came up 5 different flavours of Freak cakes and is bound to have a massive sugar rush. Each Freak Cake (4 inch~) is priced at $14.90 with limited quantities daily. Flavours available are Red Velvet Cream Cheese, Caramel Cookie Butter, Coffee Kaya Coconut, Matcha Black Sesame & Smoky Nutella. Among the 5 variations, we had Smoky Nutella and Matcha Black Sesame, I'd definitely prefer the latter to the former. It comprise layers of soft matcha sponge, matcha buttercream then drenched in rich black sesame glaze. So good. All in all, the new and revamped menu showcases a couple of interesting dishes, merging traditional flavours with creative twists. Will drop by for more waffle fix in future.